A four centre self-guided bike ride of the Dingle Peninsula and Coast in County Kerry, Ireland starting and finishing in Killarney. Tour price includes 5 nights bed and breakfast in en-suite guesthouse accommodation, 4 days of cycling, transfer of luggage each day, hire of a hybrid touring bike, and detailed notes and maps. Telephone back-up and emergency support are also provided throughout the tour. PLEASE NOTE: The only meal included in the tour price is breakfast. This Dingle Peninsula bike ride takes you through some outstanding scenery around the Ring of Dingle from Killarney. Within its small area, the Dingle Peninsula has more antiquities, historic sites and varied mountain scenery than any other part of Ireland. On this round trip, you will pass through Anascaul, Inch and on to Dingle, the most westerly town in Europe. It is an excellent centre with many famous restaurants and traditional pubs and yet it still retains much of the old-world atmosphere of a fishing village. On the route back, you bike the northern side of the peninsula, passing over the Conor Pass with magnificent views of Tralee Bay and the Maharees, and the many beautiful beaches which dot the coastline into Tralee. You finish back at Killarney. The guesthouses will provide you with information on nearby pubs and restaurants for your evening meals. You are free to choose your own routes, between the accommodation, but you have the service of the luggage transfer van (a phone call away) if things go wrong. The average daily cycling distance is a comfortable 15 - 31 miles (24 – 50 km). The tour starts and finishes in the beautiful town of Killarney, where we kit you out with your bike. DAY ONE: Bike Ride from Killarney to Killorglin - 26 miles (42 km) Bike through the wonderland of Killarney National Park with perhaps a stop at Muckross Friary and Muckross House. Continue onto Killorglin, home of Puck Fair. Overnight: Killorglin, County Kerry, Ireland. DAY TWO: Bike Ride from Killorglin to Dingle - 33 miles (54 km). Go for a swim at Inch Beach and bike onwards along the wild Atlantic coastline of Dingle Bay to the colourful fishing port of Dingle Town with its 50 pubs, craft shops, restaurants and even a resident dolphin, Fungi. Overnight: Dingle, County Kerry, Ireland. DAY THREE: Bike Ride from Dingle to Castlegregory - 23 miles (37 km). Today's bike ride takes you over the highest road pass in Ireland, the Conor Pass, and the spine of the peninsula to reach the beaches of the Maharees Peninsula. Overnight: Castlegregory, County Kerry, Ireland. DAY FOUR: Bike Ride from Castlegregory to Killarney - 30 miles (48 km). The bike ride starts with a mountain pass, once again over the spine along less-travelled backroads before lunch. The final section takes you along the inner end of Dingle Bay to arrive back in Killarney. Overnight: Killarney, County Kerry, Ireland. Departure day: The tour finishes in Killarney after breakfast. TRAVEL KERRY AIRPORT to KILLARNEY (NOT included in tour price): Private taxi collection can be pre-booked to meet you on arrival. There are 10 buses a day from Kerry airport to Killarney. 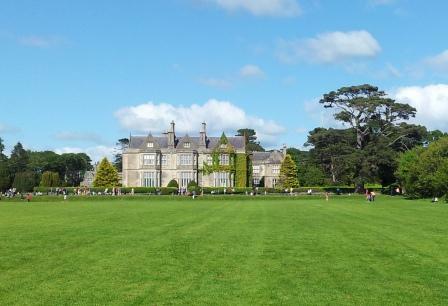 TRAVEL from CORK or DUBLIN AIRPORT to KILLARNEY (NOT included in tour price): Cheap Direct flights are offered by Air SouthWest to Cork and Dublin. There is a bus or rail service from either Cork or Dublin to Killarney. TRAVEL from KILLARNEY to SHANNON, KERRY or CORK AIRPORT (NOT included in tour price): We can arrange a private hire taxi if you require this. E-bikes available £80 extra or Road bikes £50 extra. GRADE D (cycling): Between 15 - 31 miles (24 - 50kms) a day. There are some longer mileage options available on certain days. We recommend that clients bring their own helmets and raingear for comfort and hygiene purposes. You will start cycling about 10am and finish at approx. 4pm. These grades are for guidance only and will depend on weather conditions and your fitness.